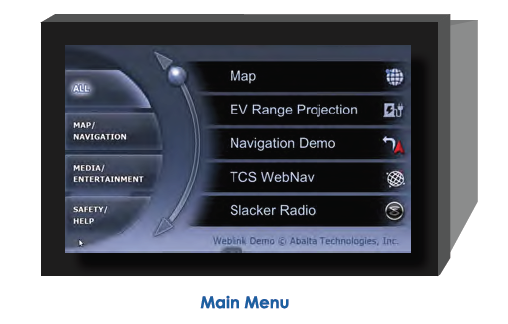 WEBLINK is an app integration technology for in-dash car systems developed by Abalta Technologies. The company focuses on bringing smartphone connectivity to the car through various software and hardware solutions. They make a few other products with similar functionality in mind. WEBLINK isn't an in-dash car system, it's just the technology behind app integration in the car. WEBLINK basically includes using a browser to render smartphone apps on the headunit's screen. The interface is highly customizable and depends on the app developer. Apps can run in HTML 5, CSS or Java to work this way. While most of the information on the WEBLINK page is technical here is a short list of the features and how things work. WEBLINK can be used by existing car entertainment system manufacturers to bring smartphone apps to the car. A little more competition never hurt anyone and if there's anyone to gain from this it's the consumer. There's no doubt that app integration in the car is the wave of the future. The lines with regards to safety while driving are fine though and app developers and car entertainment system manufacturers have to take this into consideration at all times. We'll keep an eye on WEBLINK and see which manufacturers take advantage of this technology in the coming months. The interesting part about this technology is the ability to make use of the smartphone apps inside a car. This will give rise to smart machines that will offer better services and improve the customer experience for users. MobiAppHub iPhone iPad Games For Fun, Creative, Entertaining And Educational.. Yes, you can take a photo with your smartphone, upload a picture from your photo library and share it in the app and with your friends. You can also share your photos through other social networks. We have taking photo sharing to the next level - now you can share up to four photos, or Snaps (as we like to call them) and get live feedback from your friends. Let them help you decide which is the best snap. Greedy Dog iPhone App here & Download the app and enjoy it on your iPhone, iPad, and iPod touch.